If you can’t find the answer that you are looking for go to our Contact Us page or the Green Support Tab at the bottom right side of each page, and send your question over – or feel free to call us at 817-886-0302. Click on the question to scroll down to the answer! What are the advantages of using Upgrade My Credit? Are you members of a trade association? How can we build new credit? How do I send you my credit reports? How much does bad credit cost me? Is it legal for Upgrade My Credit to help me? How much does your service costs? More Questions? Click our ASK US button on the left and ask away! We can dispute claims directly with creditors. We enforce your rights under the various federal and state credit laws. On your behalf we can demand a creditor address and settle debts. We research and keep current our knowledge of consumer laws and their changes, interpretations, and applicability of those laws. We govern ourselves according to the rules and principles of professional conduct. We are happy to offer a 40% discount for couples to encourage you to sign up at the same time, and you don’t have to be married to be considered a couple for the discount. It is important for both of you to have good credit in order to reach your credit goals. When you sign up, we will set up separate files and you will each get the benefit of individualized attention. The cost of credit repair is small compared to the cost of living with bad credit. The difference between buying a $20,000 car with good credit vs. bad credit can be as much as $200/month, or $12,000 over a 5-year loan. The consequences of having damaged credit when buying a vehicle is nothing compared to the effect of damaged credit on a home loan. A typical home of $150,000 can cost as much $70,000 more in interest over the term of a 30-year loan, if you are buying the home with damaged credit — IF you can even buy a home in today’s market. Typically you will not be able to get an unsecured credit card with damaged credit. The secured card accounts you may be approved for will typically have higher rates and low limits. Insurance premiums are usually higher, and certain job positions may not be available to you. Once we’ve received your credit reports, we will analyze your credit history to identify items that are responsible for bringing your credit score down – including not having enough current positive credit. We will recommend and provide ways to increase your score, as well as draft letters to dispute the negative items on your behalf that may not be yours, are not being reported correctly, or are obsolete. Upgrade My Credit’s letters are expertly designed such that credit bureaus will accept the dispute and conduct an investigation. A disputed credit listing must be verified as accurate for it to remain on the credit report. If the credit listings contain an error, the credit bureau may simply correct the item, but, very often, disputed credit items cannot be verified, and by law cannot be reported if it remains inaccurate. Furthermore, the investigation must be completed within 30 days or the listing must be removed. 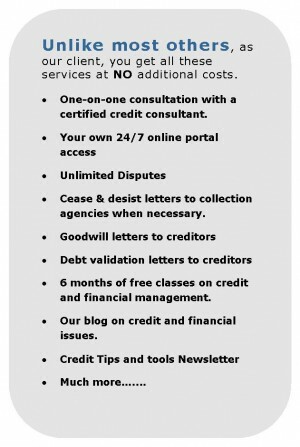 Negative credit listings that are inaccurate, unverifiable or absolete are deleted from peoples’ credit reports each and every day!